J.H. 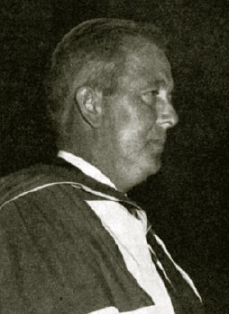 Stewart Reid was the first Executive Secretary of the Canadian Association of University Teachers. The appointment of Dr. Reid in 1959 marked a new stage in the history of CAUT. Stewart Reid was raised in New Westminster, British Columbia. Following his graduation from the University of British Columbia in 1929, Stewart Reid worked as a newspaper reporter in Seattle and Portland, Oregon, and as a high school teacher in New Westminster. In 1942, he received his Master's degree from the University of British Columbia, and in 1944 went to the University of Toronto as an Alexander Mackenzie Fellow in the Department of History. After completing his Ph.D. there in 1946, he served for a year as a lecturer in history before becoming Chairman of the Department of History at United College.In 1963, he received the honorary degree of Doctor of Laws from the University of Manitoba. The CAUT Annual Meeting on June 6-7, 1959 proved to be a landmark in CAUT history. At that meeting, Stewart Reid was appointed the Association's first Executive Secretary, with the task of organizing a national office in Ottawa. Under Stewart Reid's leadership, CAUT became a national entity, with a clarity of purpose, influential in government circles and recognized by other national associations. The national office proved to be a successful central clearing house of information effective in keeping local associations in touch with one another. Stewart Reid died on December 13, 1963, while still serving as CAUT's Executive Secretary. To commemorate Dr. Reid's life and work, the J.H. Stewart Reid Memorial Fellowship Trust was established.